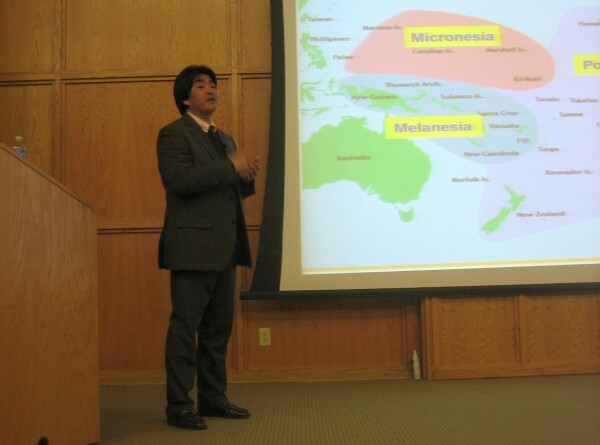 On Feb. 21, 2013, visiting professor Kiyoshi Haida talked about the Yolngu, an aboriginal people of Australia and their language. “That is how they perceive the world,” says Haida. A person who is dhuwa can only use dhuwa items but must marry a person who is yirritja. “The reason, I guess, is to avoid marriage between close relations,” says Haida. Haida also says that this world view helps them to avoid disputes. There are between 30 and 60 Yolngu clans, and each clan believes that it has its own language though all are similar. Composed of 31 phonemes including 6 vowels and a glottal stop, the Yolngu word order is free because cases are denoted with a suffix rather than a place in the sentence. Yolngu count one, two and many, and their word forms can represent singular, dual or plural. Haida says that if you live with them a couple of weeks you can understand why they only count that high. “They move around in groups of two,” says Haida. Haida, who teaches how to teach English at Shitennoji University, was adopted by the Gupapuyngu tribe of the Yolnga in 2005. He is seen as yirritja.